FAYETTEVILLE (KFSM) – Just hours after Arkansas football coach Chad Morris held his end of season press conference, the first of what is expected to be several players leaving the program was announced. 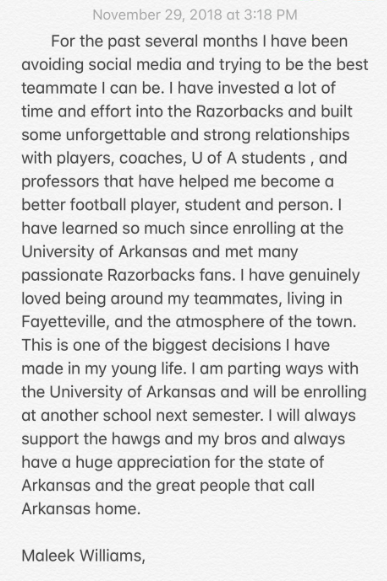 Redshirt freshman running back Maleek Williams made the announcement via Twitter that he would be leaving the Razorbacks after two seasons with the program. Williams ran for 144 yards on 27 attempts with two touchdowns, including a 68-yard scoring run against North Texas. Williams will have to sit out the 2019 season and would have two years of eligibility remaining.